Revenue came in at US$20.40 billion, slightly down compared with revenue of $20.49 billion in last year's third quarter. Net income was $5.7 billion, or $0.68 per share, down from net income of $6.1 billion, or $0.72 per share. However, Microsoft matched the revenue consensus forecast from analysts polled by Thomson Financial, and exceeded the earnings-per-share expectation by $0.05. 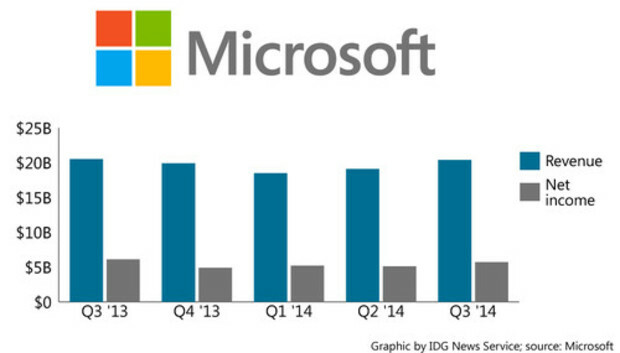 Sales growth for tablets and Windows OS helped Microsoft beat expectations. On a pro forma basis, which excludes certain one-time items like revenue recognition for several offers and deferrals from last year's third quarter, revenue increased 8 percent and earnings per share rose 5 percent. "This quarter's results demonstrate the strength of our business, as well as the opportunities we see in a mobile-first, cloud-first world. We are making good progress in our consumer services like Bing and Office 365 Home, and our commercial customers continue to embrace our cloud solutions. Both position us well for long-term growth," Microsoft CEO Satya Nadella said in a statement. Nadella was appointed to the CEO post in early February, before the halfway mark of the third quarter, which ended on March 31. The Devices and Consumer division's revenue grew on a pro forma basis by 12 percent to $8.30 billion, while gross margin shrunk 1 percent to $4.71 billion. Some highlights were a 4 percent revenue increase in Windows OS sales to hardware vendors, and a 50 percent revenue increase in Surface tablet revenue to $500 million. Revenue for the traditional Office suite, sold via perpetual licenses, rose 15 percent, thanks primarily to sales in Japan. Combined with Office 365 Home sales, revenue for those consumer-focused versions of Office increased 28 percent. The Commercial division's revenue rose on a pro forma basis by 7 percent to $12.23 billion, and gross margin rose 6 percent to $9.91 billion. The division's performance was helped by a more-than-100-percent revenue increase from Office 365, the cloud and subscription suite of server and desktop productivity applications for businesses, and by a 150 percent hike in revenue from the Azure cloud platform services. Other highlights from the Commercial division include an 11 percent revenue increase in Windows volume licensing for business customers and "double-digit" revenue growth for collaboration and communication server products Lync, SharePoint and Exchange, as well as for the SQL Server database.